When iLife was first introduced, I was mildly interested. Watching the Web broadcast of the introduction, it looked like fun, especially GarageBand. But I held off buying it for a long time – days – until I reviewed enough Web pages on Apple’s site to conclude that I couldn’t live without it. The other parts of iLife – iTunes, iPhoto, iMovie and iDVD – were no a major concern. iTunes I used all the time, and I’d made a couple short movies with iMovie, burned a couple DVDs with iDVD, and sorted pictures with iPhoto. The stumbling block was the apparently wildly successful GarageBand that, for whatever reason, made no sense to me at all. On a trip to Colorado I stopped in at the Apple Store at Cherry Creek Mall in Denver. I needed to use Sherlock on one of the store Macs to look up a friend’s phone number. (It never occurred to me to try calling directory assistance.) And there on the shelf was a copy of Apple Training Series: iLife ’04. Published by Peachpit Press, this is a very attractive book: it has glossy paper, color illustrations, and a DVD-ROM (not CD-ROM). 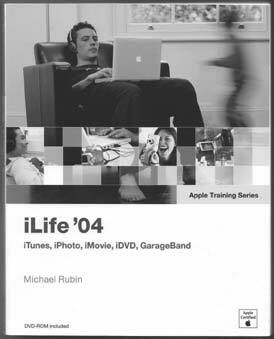 There were other books that focused specifically on GarageBand, including GarageBand for Mac OS X: Visual QuickStart Guide (also from Peachpit), but I decided it wouldn’t hurt to learn about the rest of iLife, too. As the title suggest, the book is essentially an Apple-endorsed course in how to use iLife. It is divided into fourteen chapters, each of which is explicitly called a “lesson.” Each lesson guides the reader through a series of activities, with appropriate illustrations. The DVD-ROM has sample files for the lessons, so there is no need to go out and shoot some digital video or take snapshots of squirrels. You do need an active Internet connection for some lessons, such as having iTunes look up CD track names. Each lesson ends with a bulleted list of things you’ve learned. GarageBand, as it turns out, is covered in only one of the fourteen chapters. It even has a warning that “Some people may need to avoid GarageBand for a while.” The coverage, while brief, turned out to be just enough: I managed to get GarageBand to do something useful (I thought my tunes were quite nice, even if my daughter gave me a strained “Don’t give up your day job” smile) and learned that actual mastery would take far more time than I had available. I also learned amazing new things about iTunes, iPhoto, iMovie and iDVD – and I wasn’t even trying to learn anything about them. If you’d like to learn just about GarageBand (in far, far more detail) and ignore the rest of the iLife suite, another volume in the series, Apple Training Series: GarageBand, by Mary Plummer, spends over 400 pages on the subject.